When introducing this topic to my students, we had already been talking about genocide in general with specific events relating to not just the Holocaust, but also to Rwanda. These important conversations came up as part of a lesson regarding being a bystander and bullying, which progressed into larger inquiries about human behaviour and genocide. Obviously, teaching about the Holocaust or any genocide over only a few class periods would not do it justice, but for me, the strategy was not to facilitate a course on the Holocaust and genocide. 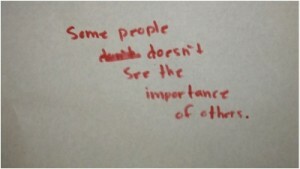 Rather, it was to have starting points for students to think of the Big Ideas related to how we view others who are different than ourselves. 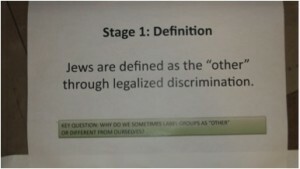 Students are able to explore, understand and dive deeper into what were the root causes of the Holocaust, yet do it in a way that enables them to connect with their own experiences, without making facile comparisons. 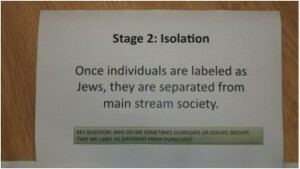 To do this, I used Holocaust scholar, Raul Hilberg’s “Six Stages of Mass Murder” with my students, and gave them an overview of the 6 Stages: Definition, Isolation, Emigration, Ghettoization, Deportation and Mass Murder. We did a placemat activity (big paper) in which I taped an 8.5 x 11 sheet with one of the stages to a piece of blank chart paper. Below that, was a broader question related to the stage. 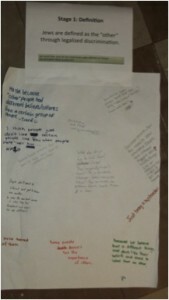 The 6 stages were placed around the room and students were asked to respond to each question on the paper. I explicitly taught and modeled how to respond to the questions, asking students specifically to relate it to their experiences, and make connections with issues that they already know about such as experiences with “othering”. 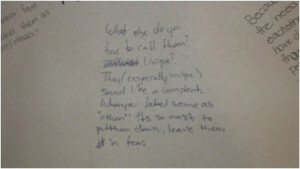 Below are some examples of what was written. 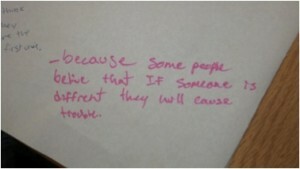 I feel that this lesson had an impact on my students because there were a number of occasions where my students made connections back to this conversation. For instance, they spoke of isolation and discrimination when describing the experiences of Chinese Canadians in history class. 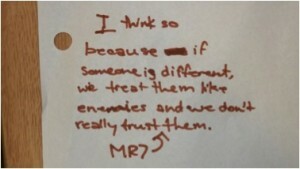 This strategy enabled students to find commonality in their experiences. In debriefing the activity, students were able to understand that genocide does not just happen; it's a process that begins with "othering" and isolation.